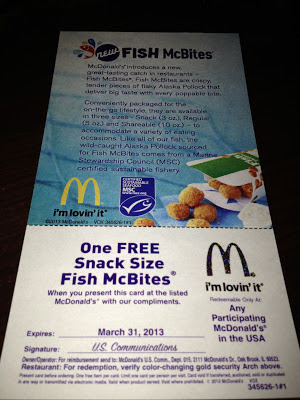 I have 10 coupons each good for a FREE Snack Size Fish McBites at McDonalds. These are only good at particpating restaurants and expire 3/31/13. RULES - You must be 18 or older to enter and live in the US. Giveaway ends 3/5/13 at 11:59 pm eastern. 2 winners will each receive 5 coupons. Winners will be drawn via random.org and emailed. Winners will have 48 hours to respond or another winner will be picked. Disclosure: I received these coupons free of charge through the McDonalds Family Arches Community. No other compensation was received. Haven't tried these yet, but I want too. I love the fish sandwiches that McD's has too. Thanks so much. I haven't tried them yet, but I'd like to! Not yet, but I have heard good things! Yes, we tried them and like them! No, I haven't but I'm going to soon. nope but i really want to. they look yummy. sound good would like too. I have not tried them but have heard from others that they are good. Yes, I have. They are surprisingly really good. I am going to order them again. I haven't tried them yet, but I would like to. I have not tried the Fish McBites at McDonalds yet. nope, i havent tried them yet! No we haven't tried them yet, but we are really eager to. tried them - loved them! nope not yet, they look good though. No, I haven't, but I want to! NO, I HAVE NOT TRIED THEM YET..
Tell me if you have tried the Fish McBites at McDonalds yet. I haven't tried them yet, but I want to. I have not tried them yet but I plan to. No, I haven't tried then yet. No, but I would love to try them soon! no i havent tried them yet. My son has, he loves them. Not yet, but it looks like something my son would really like. I have not yet tried Fish McBites! No I have not tried yet! I haven't tried the new McDonalds "Fish McBites",and I'm looking forward to trying them. My fiance got a box and I tried one. They're good! i haven't tried them yet, but want to! i have not yet tried them! I haven't tried them, yet, but I plan on it! I haven't tried them but I want to! I have not but they look pretty good. I tried them, they are pretty good! I have not...but my niece likes them! I haven't tried them yet, but I've been intending to. I haven't tried them yet! But they sound great!